Threads, the second book in the Small Things trilogy, will be released on October 8th, 2013 – only six weeks from now! Threads will be available in trade paperback as well as various eBook formats. 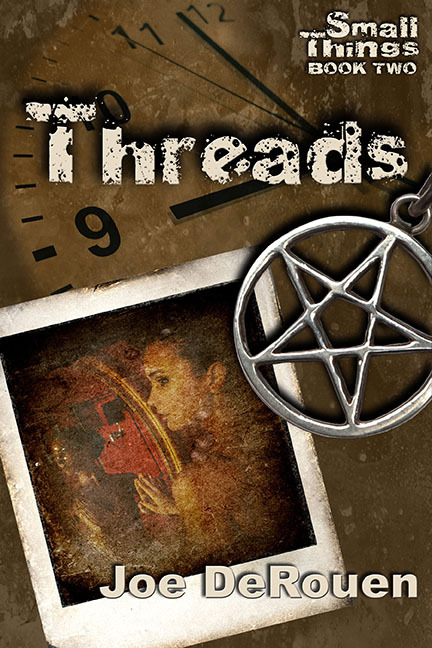 Courtesy of the amazing Renee Barratt of The Cover Counts, the cover of Threads! This entry was posted in Fiction, General and tagged book, cover, reveal, small, things, threads. Bookmark the permalink. Amazing Joe! I really do love it! I absolutely love the cover! Its awesome! This cover definitely peaks my interest in your book. I think a cover is very important. The first thing the reader see’s is that and it needs to attract enough interest to get someone to buy the book. This cover definitely gets my attention!